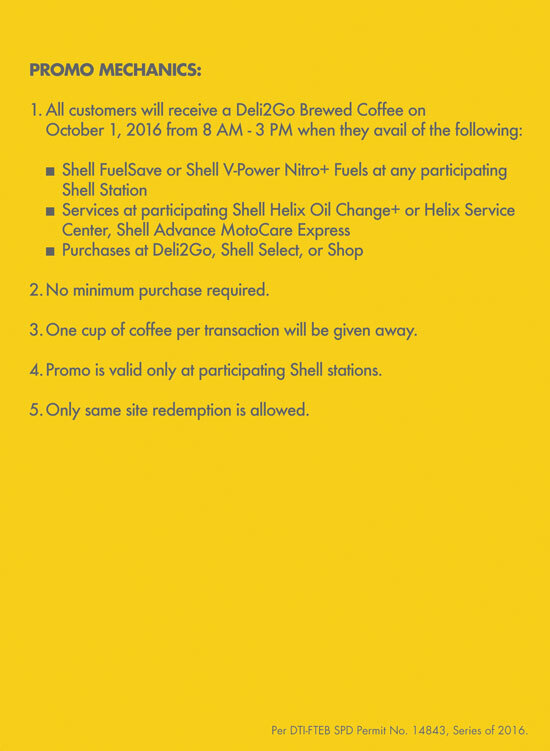 Pilipinas Shell celebrates International Coffee Day by giving away a cup of Deli2Go coffee to those who will drop by participating stations. This is part of Shell Specials, a series of surprises at the Shell station, which aims to celebrate with all kinds of customers during special occasions. Nothing beats starting the day with a good cup of coffee. It not only wakes you up, it also helps keep you focused and alert. Whether you’re headed to work or to an exciting new destination, coffee is the perfect pick-me-upper at any time of the day. On International Coffee Day, Pilipinas Shell is giving its customers a much-needed boost to conquer the road and the day ahead. 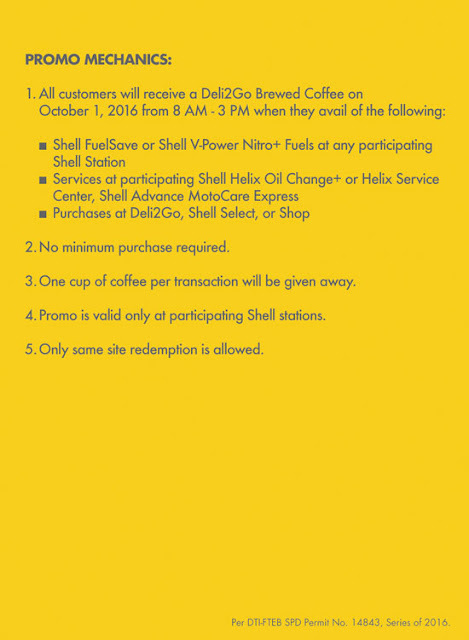 This coming October 1, all customers who will gas up, shop, or avail of automotive services at any of the participating Shell stations from 8 a.m. to 3 p.m. will receive coffee from Deli2Go! Deli2Go is the perfect stopover to relax and take a break from your journey. Aside from different types of coffee, it offers an exciting selection of satisfying and affordably-priced meals and quick snacks to fuel customers on the road. 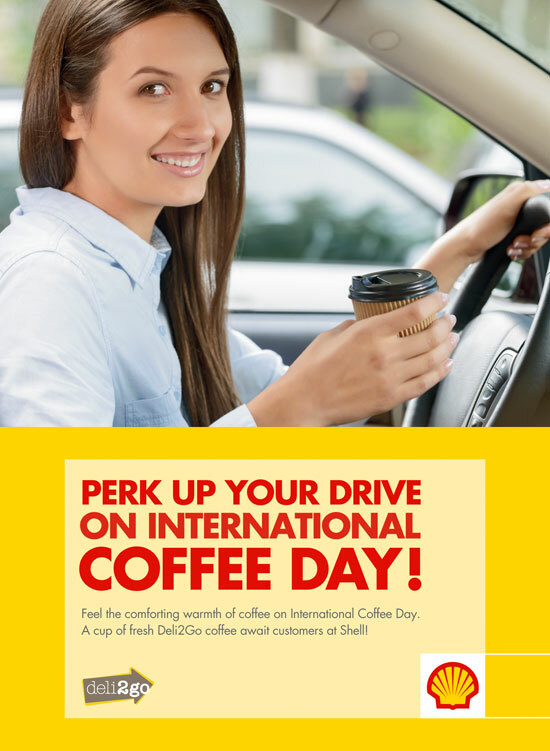 “This coming International Coffee Day, Pilipinas Shell is all set to perk up your drive by treating you to a well-deserved energy boost from Deli2Go. Whether you’re just about to start your day or taking a break from a long day of driving, we’ll be there to help you and your loved ones stay alert and energized on the road,” says Anthony Lawrence Yam, Pilipinas Shell Vice President for Retail. Pilipinas Shell is committed to providing delightful experiences for its customers every time they visit a Shell station on special days, because at Shell, everyone is special. Shell has more surprises in store for its customers soon, all designed to delight them in more ways than one. Stick around, and have a Shell Specials day!